History - What Is Aran Knitting? If you've seen classic, densely cabled and patterned drop-shoulder sweaters, you've seen Aran knitting, or at least knitting in the style originated in the Aran Isles. The sweaters, sometimes called fishing shirts, became a popular product of the Aran Islands—three islands off the coast of Ireland called Inishmore, Inishman and Inisheer—in the 1930s and '40s. There's some controversy as to when and how these sweaters began to be knit in their distinctive embossed style, though they came to widespread attention thanks to a man named Heinz Kiewe, who first saw a sweater of this sort in Dublin in 1936 and worked through the years to produce patterns in the style, as reported in Richard Rutt's A History of Hand Knitting. His romantic vision of Aran sweater designs as being linked to ancient Irish art and mythology seeped into popular stories about Aran knitting, but there's no basis for these theories in fact because knitting is not that old, and any similarity between Aran and ancient designs has to do with geometry, not the fact that the two art forms developed at the same time. They write that Rohana Darlington learned through the oral history of the area that Aran knitting developed after two women from the Aran Islands visited Boston in 1906. They learned about the rich patterns that would be used in so-called Aran knitting from a "foreign" immigrant, maybe from Austria. Deciding to return home, they took their new knitting skills with them, combined the patterns with the traditional gansey structure of their homeland, and shared this approach with others. The embossed patterning developed rapidly as the fishing shirts found a ready market. 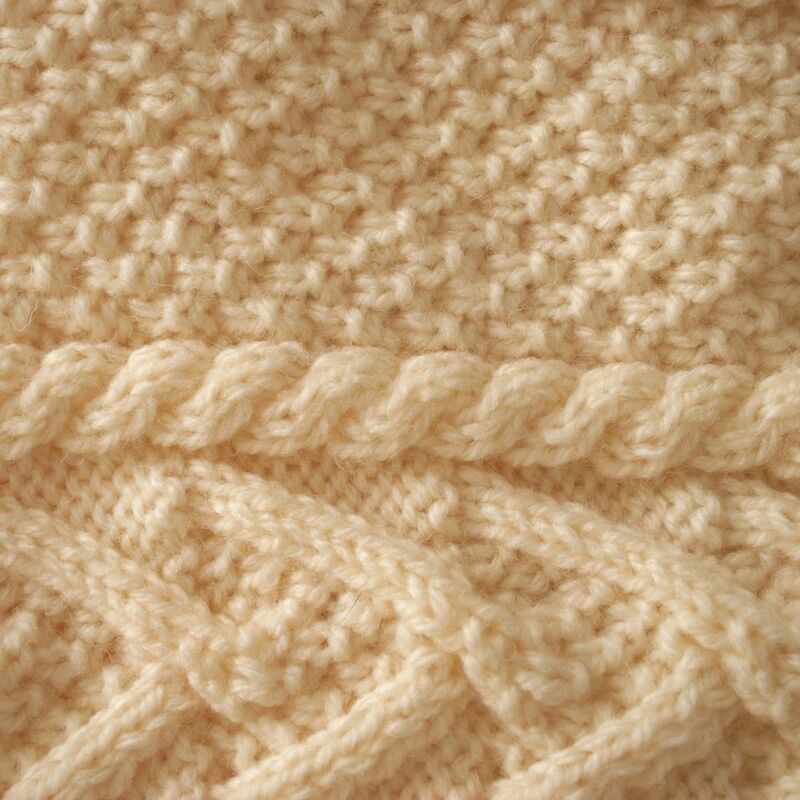 Whatever the origin, Aran knitting patterns are typically constructed with vertical panels of patterns that include ribbing, cables, textured stitching and bobbles. The designs were often repeated, sometimes smaller or in a different form, on the sleeves, and in the older sweaters a panel would run from the neckline across the shoulder and down to the cuff, which usually had a deep ribbed section that might also include cables. Later sweaters may have the body pattern continue across the shoulders rather than having a shoulder strap, and the shoulder and armhole may be shaped. Some more modern sweaters were also worked in the round instead of being flat and seamed. These days its even possible to find raglan sleeved Aran sweaters. The sweaters are made of wool, traditionally white or off-white. The patterns spread outside of the Aran Islands over time, and the first Aran design was printed in Vogue Knitting in 1956. One of the major misconceptions about Aran sweaters is that they were originally knit for the fishermen and that each family used a unique stitch pattern so that bodies of loved ones could be identified if they washed onto shore. Hand-knit sweaters from the Aran islands can still be purchased from places such as Aran Sweater Market (though they share the romantic story of how Aran sweaters came to be), and knitters from all over the world use the techniques of Aran knitting to make their own fabulous and warm sweaters, throws and other knitted items.